Marie chante le plus fort. Il est celui qui mange le plus bruyamment. He is the one who eats the loudest. Je suis celui qui a couru le moins vite. I am the one who ran the least fast. Cet ordinateur marche le moins bien. This computer works the least well. you only use the definite article le plus / le moins (there is NO agreement with adverbs, as they have NO gender). Jeanne parle le plus doucement. Jeanne speaks the most softly. Je le ferai jeudi au plus tard. I'll do it on Thursday at the latest. 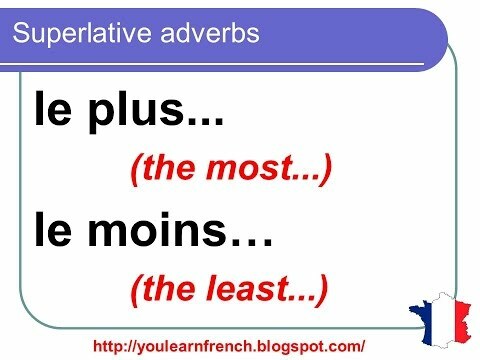 Note that to form the Superlative of adverbs, it is similar to the Superlative of adjectives, EXCEPT you only use the definite article le plus / le moins (there is NO agreement with adverbs, as they have NO gender). But one of the examples uses "au":Je le ferai jeudi au plus tard. Au = à le, hence au plus tard = à le plus tard. Peut-on utiliser "nettement" au lieu de "clairement?" Bonjour Dean ! It depends on context: "clairement" is usually used to express clarification, to make a notion or an explanation clearer (more understandable), whereas "nettement" is more physical (I see more neatly), or to mark a rupture, a clear (clear cut) difference from before. "Tu as expliqué la leçon clairement." (You explained the lesson clearly.) "Mon résultat est nettement différent du tien." (My result is clearly different from yours.) If you gave me the context you're referring to, it would be easier for me to tall you for sure :) I hope that's helpful! À bientôt !